Do you want to learn Haitian Creole (Krèyol) as you prepare to go to Haiti and make a difference?….or as you work with Haitian youth here in the U.S. and are aiming to accelerate the learning pace? Do you know someone from Haiti who wants to learn American English in order to make themselves more marketable for a job (in Haiti or the U.S.)?….or who needs to learn English in order to pass the English fluency test required for acceptance into the higher learning institution that will give them the opportunity to reach beyond their dreams? …then this program is for you. Read on. The launch of two new sets of language learning CD’s has many excited. The new products are the result of a unique relationship between Le FlambeauFoundation and London-based EuroTalk, a company recognized as one of the top language learning CD developers in the world. 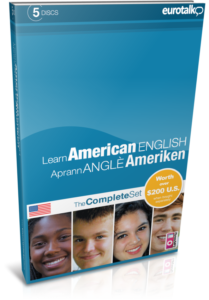 The new language learning CD offerings include the American English language learning set which features special Haitian Creole HELP guides and the Haitian Creole language learning set. Each set has 5 CD’s. The sets are part of an innovative fundraising initiative designed to assist young people in Haiti earn sustainable educational assets that will prepare them for the effective rebuilding of Haiti. These CD sets are unique in a number of ways. The special feature of having the Help guides for the English Language learning CD’s spoken in Haitian Creole, offers a significant advantage to the many youth in Haiti who speak Creole but are not fluent in French. 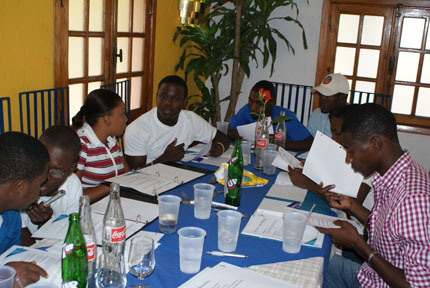 This feature means that youth in Haiti can learn English without first having to master French. By reducing the number of steps, students are able to accelerate their English learning…and have fun doing it via the highly entertaining and engaging EuroTalk format.” For young people in Haiti looking for jobs and for those aiming to attend higher learning institutions in the U.S., this advantage is invaluable. It opens the door to a whole new world. Similarly, the Haitian Creole learning CD’s offer important advantages to a U.S. audience (and other countries) aiming to become fluent in visiting Haiti and making sustainable contributions. We are pleased to be working with the EuroTalk team on this initiative and applaud the commitment. Sending the next student to school on scholarship, resulting from the funds being raised via this initiative, is already within reach. These special CD sets are available to youth groups in Haiti and in the U.S. and serve as vehicles for them in meeting educational and funding needs (see article on Le Flambeau Foundation Entrepreneurial Initiative). For more information on getting involved or on purchasing these special CD sets for youth education initiatives, please contact Le Flambeau Foundation Inc. at scg@leflambeau-foundation.org, or 305.596.2819. You may also place individual orders for these sets on-line at the Touché Market Place by clicking here (www.ToucheMarket.com). EuroTalk is making a donation to the Le Flambeau Foundation for every CD purchased from this special collection. This is innovation in its best form as the wheels are in motion for making a significant sustainable difference for the people of Haiti, now. Rebuilding moves forward. The future is bright!